Free exercise tips: Learn to exercise at the right intensity. Which is better for your workout, moderate or maximum effort? 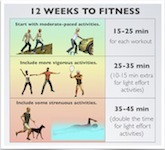 My free exercise tips begin with a guide to exercise effort. 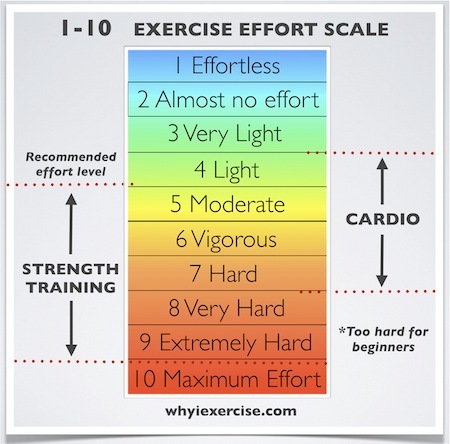 How important is your level of effort? If you are trying too hard, it can be too much strain on your body. On the other hand, if you'te not working at all, you won't get enough health benefits from the activity. The exercise effort scale and instructions below will help you find the optimal effort level for your workouts, based on your fitness level. Pay attention to how you feel during your workout. How fatigued are your muscles? How heavy is your breathing? For best use of these free exercise tips, see the effort level descriptions for strength training and cardiovascular exercise below. Give your effort a 1-10 rating for each exercise in your workout. When you finish an exercise, let your breathing return to normal before starting the next exercise. This will give you enough energy to continue. See the effort level descriptions. You can feel your muscles working, but you finished the exercise with plenty of energy left. You could have done many more repetitions of the exercise. This is a good warm up effort level. By the end of the exercise, you can feel your muscles fatiguing somewhat. Your breathing has also picked up, but you finished the exercise well before reaching your maximum effort. This is a safe strength training effort level for beginners who have no known joint or muscular problems. By the end of the exercise, your muscles are fatiguing significantly, but you could have done 1-2 more reps of the exercise if you used a maximum effort. If you are new to exercise, workout consistently for several weeks before exercising at this effort level. You have to focus intensively to complete the exercise with correct form. When you finish, you are not able to do any more reps of the exercise. Don't miss the safety guidelines (in italics) from these free exercise tips! To exercise at 9/10 or higher, you should have experience with exercise and also be free of joint and muscle problems. *Get clearance from your doctor before trying a high intensity workout. During a maximum effort exercise, your movement will be much slower on the last repetition. Your muscles may 'fail' (stop working) and keep you from finishing the move. Maximum effort workouts can give you great results, but they are also have the highest risk of injury. Do a max effort workout with a partner who is ready to assist you if needed. Also, to avoid overuse injury, no more than 1 max effort strength workout per week is needed, though you might have separate workouts for different muscle groups. Give your effort a 1-10 rating for every 5 minutes of the activity. If your effort is 3/10 or less, you aren’t sweating, you did not feel your heart rate pick up, and you could sing during this activity. You need to work harder (at least 4/10) to get a health benefit from the activity. You can talk, but you couldn’t sing while you are exercising. You may have broken a sweat. Your breathing and pulse have noticeably picked up. The workout is not as casual--you have to concentrate more on the activity to maintain this vigorous effort level. If you are new to exercise, workout consistently for several weeks before exercising at this effort level. You are breathing heavily and you can’t say more than a few words without taking a breath. As with strength training, the higher your level of effort, the more focus you need to maintain proper form during the exercise. You are gasping for air by the end of the exercise, and you need several minutes rest before you could start again. For cardio efforts of 8/10 or higher, it is best to have some experience with exercise and also be free of joint and muscle problems. *Get clearance from your doctor first. Build a 12 week program that will help accelerate positive changes in your body, including faster strength gains and loss of body fat! A consistent exercise routine will lower your risk of chronic health problems and premature death as well. You can use all types of exercise in your weekly workout routine. Pick the exercise or physical activities of your choice by calories burned and your fitness level. Return from free exercise tips to free home exercise programs.